In a lot of ways, Samantha Young is like most kids in the elementary school age bracket. The 9-year-old loves to have friends over to hang out at her house. 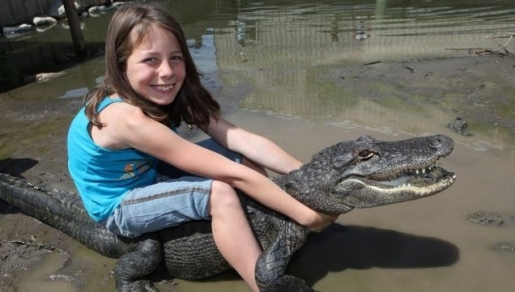 Of course, Samantha Young is a bit different from most kids, because when Samantha shows off her special talents, she’s wrestling 8-foot-long alligators into submission. Some hobby! Jay Young, the park’s owner and Samantha’s father, says that knowing how to wrestle gators is very important, as the family lives on a farm with 350 alligators, some of which weigh as much as 600 pounds. As anyone can tell you, gators are not to be trifled with, as they are nature’s perfect killing machines.